Michael Burks is the liberator of the next generation blues guitarists. Although still considered a new blueblood, Burks has been performing for more than 30 years and is capable of expressing the blues like its masters did during the genre’s heyday. You likely know about Burks’ fiery guitar skills, but what about his singing skills? They lie somewhere between crooning and lamenting as substantiated on tracks like "Icepick Through My Heart" from his new CD, Iron Man (Alligator). Nothing is contrived on Iron Man. It all sounds and seems entirely natural. Much of that credit goes to recording live in the studio with Burks’ high-powered touring band as opposed to using studio stars as in the past. Dubbed from Burks’ nickname, which was earned from his lengthy live sets, formidable guitar playing, and ability to drive hundreds of miles non-stop, Iron Man is one of those CDs which is ideal for testing the potency of your sound system. One minute into the first track, a ripping guitar solo lets you know what’s in store for the next hour. Seven of the album’s 12 songs were written or co-written by Burks. Common themes include wasted dreams, bad relationships, and shedding tears. On "No More Crying," Burks sings (“I cried so many tears/I have no tears at all”). Jimmy Johnson’s "Ashes In My Ashtray" is given an interesting reading because Burks’ plaintive vocals are so different from Johnson’s comforting vocals. Best of all you can figure out the lyrics because the former mechanical technician for Lockheed-Martin sings them clearly. The song’s hurt and betrayal burns from the smoldering fretboard just as it did on the original version. Burks’ wild slide guitar and ardent vocals sound very similar to Luther Allison on "Strange Feeling." "Quiet Little Town" is rhythmic radio rock and it contains a memorable riff. "Fire And Water" – originally made popular by the band Free and later covered by Wilson Pickett – contains another radio friendly rock steady groove. The pop/rock jam "Salty Tears" is infused with southern soul. Southern rock flourishes on "Don’t Waste My Time" and "Hard Come, Easy Go." Burks projects as much fervor as he vocally can on the former, and then finishes the kill with a torrential guitar exhibition. The latter possesses a raw Tinsley Ellis edge and a blues/rock riff. It was written specifically for Burks by label-mate Ellis. Whether you have experienced the anguish of empty promises or not, you’ll know exactly what it feels like after listening to Burks’ song of the same name. The arrangement and lead guitar work is impassioned and Burks’ vocals are exercised to their maximum. The brilliant track reveals a vulnerable side of Burks. The intensity of the performance easily equals, if not exceeds, "All Your Affection Is Gone" from I Smell Smoke. Compared to his last two Alligator CDs, the most noticeable difference is the fact that Burks’ influences, e.g., Albert King, are no longer on display. 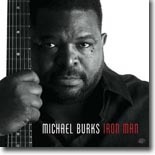 Alligator’s president, Bruce Iglauer, admits, “Watching Michael Burks mature into one of the most exciting bluesmen of his generation has been a treat for me.” This CD clearly portrays Burks as one of the best contemporary blues players whose every ounce is made of iron ore.